Ok so things are getting are getting back to normal now. Last week the kids all got sick with a bad flu/virus thing. Temps were 39-40 most the time and they were all feeling terrible. Stevie had it for over a week, Loch had a temp of 40.2 at one stage and I was so close to taking him to hospital and Jimmy had a gastro type thing and was throwing up. Fun Fun Fun!!! Just as they were getting over it, I got it. Sharing is caring!!! Sunday the 9/9 was Jimmy's birthday and I felt terrible, luckily we had a party the week before as Mike was at work for his birthday. Monday felt awful then Tuesday I ended up in the ambulance. I think it was the flu too but mostly exhausted! 4 kids has really taken it out of me and I was just stuffed. I took little Sonny in the ambo with me and Mike family took the older 3. Luckily Mikes sister lives close to the hospital and she came in and looked after Sonny. She ended up taking him home with some bottles from the hospital, which I was very nevous about as he has never had a bottle, but he was fine. Mike got on a plane from work straight away and got back to Vic about midnight and went and got Sonny and took him back to stay with the other kids. Anyway with lots of rest I feel so much better and I ended up having about 7 of the iv glucose bags so I'm sure that all perked me up. 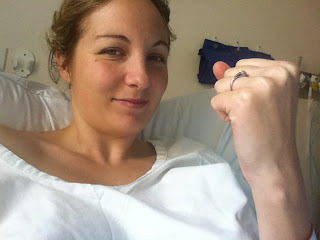 And after lots of expressing in hospital, Sonny is back on the breast! Yay. This was the pic I sent to my sister just before I went home, fist pump!! Dork, I know. Mike had to go back to work after a week but we are all recovered and feeling mostly normal.